ller instinct achieved their European Challenge Cup qualification goal in France, and now a date beckons with top seeds Gloucester in April. A return to Kingsholm to face the English premiership side may well be considered the toughest of the quarter-final draws, but Connacht have been there before and know they left the win behind them on that occasion. That was Heineken Cup rugby under former coach Eric Elwood, and Connacht, in control throughout the game and heading for victory, were stung by an injury-time try from replacement Jonny May with Freddie Burns’ conversion making it 23-19. The Gloucester outfit will be firm favourites to win again - the last occasion Gloucester won all six pool games in Europe and scored 29 match points, they went on to win this tournament in 2006. However Connacht’s belief and never-say-die attitude, coupled with an ability to stand up to big forward packs, has seen them through some tough encounters this season - epitomised by Saturday’s final pool fixture against La Rochelle when two tries in the final six minutes produced the necessary victory, a four-try bonus win by 30-20. "At the end of the day it's an outcome we have achieved on the back of hard work - sixth in the Pro 12, which is where we want to be, and in the quarter-finals of Europe,” says coach pat Lam. Faloon, who was forced to retire after just 14 minutes with a shoulder injury, is due to see a specialist today, while the rest of the squad will be back training next week with the focus firmly on a crunch Pro 12 fixture with Scarlets in Wales on February 15. Lam says Connacht’s late late show last weekend is testament to the squad’s attitude. Having weathered a second-half La Rochelle siege, but still trailing by 20-16, Connacht produced two stunning individual tries in two minutes. "I sent the word out to get Niyi [Adeolokun] ready and make sure he was really warm because at the time he had only 13 minutes to do something. Fair play to Paul Bunce and Dave Ellis on the sideline because he went out there and showed he was definitely warm." The former Trinity winger, with his first touch, cut through the defence from just inside the La Rochelle half before putting his foot on the accelerator to race through for the third try. Jack Carty's conversion made it 23 - 20. "The message was 'let's go again, put the foot on the throat. I want everyone switched in to what we trained this week about scoring straight away', and fair play." Immediately from the restart, Connacht grabbed possession and it was key striker Matt Healy who twice kicked ahead before winning the race for the line to claim the crucial fourth bonus try. "It's a massive result for us. All week the focus was about performance, not the outcome, because we all knew we had to win the game. This week we took a lot of learnings from last week, making sure we improved. I asked the guys to come and see me during the week, give me one thing to put some extra work in, and, fair play, they spent more time with the coaching staff on areas where they could make a difference, and it certainly made a difference out there." Connacht enjoyed the perfect start when Ireland squad member Kieran Marmion bagged a try within three minutes from Healy's counterattack deep in their own half, while outhalf Jack Carty contributed two penalites. However when prop Nathan White was yellow-carded in the 26th minute for killing the ball after an earlier warning, the home side made it count with a penalty try which Barraque converted. And before the break some poor defensive concentration resulted in No 8 Albain Meron crashing over, giving the home side a 20-11 lead at the break. Connacht started the second half with greater intensity and were rewarded when flanker Eoin McKeon crashed over from the penalty kicked to touch. It remained that way until the 74th minute during which time Connacht produced an immense defensive effort as the home side laid siege on the Connacht line. Having weathered that storm, two moments of individual brilliance ensured Connacht join Leinster in European quarter-finals. 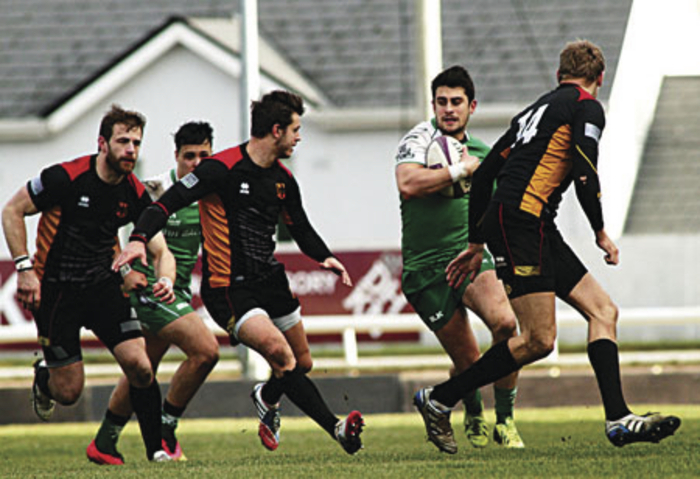 Connacht: M Muliaina (c ); D Leader, D Poolman, C Finn, M Healy; J Carty, K Marmion; R Loughney, T McCartney, N White, Q Roux, A Browne, E McKeon, W Faloon, G Naoupu. Replacements: J Muldoon for Faloon ((14 ), JP Cooney for Loughney (41 ), C Blade for Marmion (51 ), D Qualter for Browne (64 ), D Heffernan for McCartney (69 ), N Adeolokun for Muliaina (74 ).